First Novels Club: Robin Benway on Writing a Multiple POV Novel and GIVEAWAY of The Extraordinary Secrets of April, May, and June! Robin Benway on Writing a Multiple POV Novel and GIVEAWAY of The Extraordinary Secrets of April, May, and June! Today the FNC's lucky enough to have Robin Benway --- author of AUDREY, WAIT! and this August's THE EXTRAORDINARY SECRETS OF APRIL, MAY, & JUNE --- share her hard-earned wisdom on the challenges of writing a multiple point-of-view novel. This guest post gives an awesome insider look at an author's process of finding the true voice of her novel and conquering her fear of writing the unknown. When I got the idea for writing about three sisters in my new book, "The Extraordinary Secrets of April, May & June", my first thought was, "Ohhhh, SISTERS." My second thought was, "Ohhh, sisters with SUPERPOWERS." And my third thought was, "Ohhhh, NOOOO." The tattoo that began it all. I've never written about sisters before. I don't even have sisters! In my first book, "Audrey, Wait! ", I made sure that Audrey was an only child so I wouldn't have to worry about sibling relationships. And all that careful planning backfired the day I saw a picture of a model with the words "April May June" tattooed across his collarbone. I saw that picture and thought, "Those are girls' names. Those girls would probably be sisters," and I couldn't stop thinking about who those sisters would be. For me, though, the hardest part was figuring out how to write April, May, and June so that each girl would be able to show who she was. I was so scared that I wouldn't be able to do that well enough, and I especially dreaded trying to write three first-person narratives. So I got creative. I tried writing each character in the second person. Major, major disaster. No one will ever see that because the mere memory of that writing experiment makes me want to crawl in a hole. I also tried writing everything from April's point of view, the oldest sister who can see the future. It wasn't as big a disaster, but it didn't work. It felt forced and phony and sort of made me want to bang my head against a wall, and it also made April sound like a crazy oracle from a Greek tragedy, which wasn't the vibe I wanted. So I tried it, and what I discovered was that by writing in first person in three different ways, it made me find my characters for the first time. I had to discover their individual voices, their words, their thoughts and ideas and emotions. They had wanted to talk all along, but I had been stopping them. 1) Let your characters tell you who they are. When I first imagined the middle sister, May, I thought she'd be shy and sweet, a pale little wallflower who has the ability to become invisible. When I wrote in her POV for the first time, though, she came roaring to life! She was mean, tough, and most importantly, hurt. I hadn't truly seen who she was. I even felt a bit apologetic towards her! 2) Let your characters tell their unique story.What I discovered while working on "AMJ" is that each sister reacted to situations in a completely different way and it was my job as a writer to let them describe it. April, for example, is horrified to discover that she and her sisters have superpowers, while June, the youngest sister, is thrilled to discover that she can read people's minds. I had originally thought that all three sisters would be traumatized by this development, but not June. Who knew??? 3) Write each character one at a time. In the beginning chapters of the book, I'd be writing in April's voice and think, "Oh, May's gonna hate this." Or I'd write in May's POV and realize that June would disagree completely. And that was totally okay. I finally learned that I had to write each sister separately, without worrying what the other ones would say or do, just like real-life sisters. Once I realized that, writing became fun! I loved watching the girls react to one another, and it was especially interesting to see how each of them reacted to their parents' divorce. Will I write another multiple POV book again? I would love it! And hopefully April, May & June would love it, too. Wanna know why the FNC recommends you read AMJ? Check out my thoughts here! 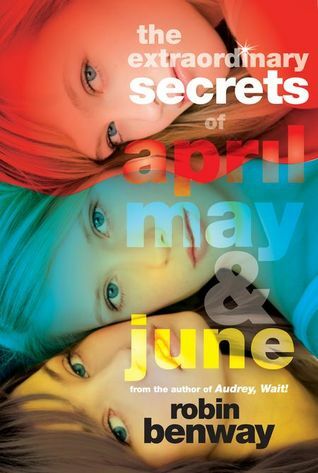 The FNC is giving away our ARC of THE EXTRAORDINARY SECRETS OF APRIL, MAY, & JUNE to one lucky reader! Just fill out the form by 7/22 to enter. I love it when characters speak up and surprise us. I'm writing a YA paranormal now in two pov's so this was timely and helpful. Thanks. And, the book looks awesome! I absolutely loved Audrey, Wait so i can't wait to read this! Thanks for the giveaway. Audrey Wait was such a fun read. Can't wait to get to this one! I'm doing a multiple POV, and I always thought that meant I coudn't do first person. I can't wait to see how you've done it. Thanks for the inspiring words.